We’ve been super-busy outside and I finally have some photos to show! One of the first items we tackled was this very large-and-in-charge Yellow Bell bush that had gotten a bit out of control. I love landscaping and especially the opportunity to inherit mature plants when we move since my first 2 homes had nothing, making me start from scratch. After our last home, which was beautifully landscaped with mature plants, I learned the tough lesson that sometimes you have to cut overgrowth WAY back. This was a perfect example. I love Yellow Bells. They are drought-tolarant which is very important in our climate and thrive for most of the year, dying back only during the few months that we get occasional overnight freezes. I did not, however, love this one. Jason was the first to mention that it had to go. I was resistant at first, but after it took forever to bloom, only got the few flowers that you see above, and then started falling into the pool, I was sold. The day it mostly fell into the pool, it mostly ended up in a brush bag. After asking around, it turns out that we aren’t the only ones with this problem. They are cute, little plants at the store, and most people don’t realize that they can get to be the size of an SUV. Jason went out to finish the job because after years of marriage, it has been decided that he is exponentially better with shovels. 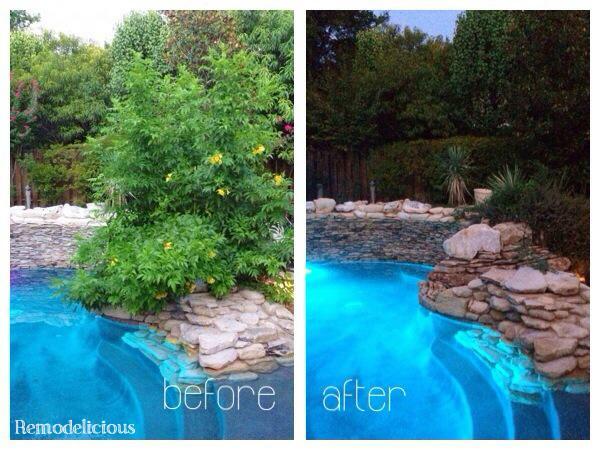 He discovered that the roots were also out of control and growing into the rocks surrounding the pool. SO glad we agreed to take it out! We replaced it with a Pride of Barbados (more info here), which is difficult to see here because it is small and not currently blooming. Its another heat-loving, drought-tolerant plant with beautiful red, orange, and yellow blooms. It blooms during the summer when the pool is enjoyed most, and should never get as massive and full as the Yellow Bell. It’s a beautiful contrast to our blue-bottomed pool and is right at home with the patio plants in red pots. Mature plants can be fabulous, but sometimes you need to know when to cut them way back or even replace them. We would have moved this one if possible, but the roots were too large and tangled into surrounding rocks. The weather has been beautiful (we are in Texas and consider rain beautiful weather) so there will be a lot this week from our outdoor projects getting ready for a great fall patio season.